Any survival instructor worth his or her salt will be the first to tell you that there are no universal solutions in the world of preparedness. What works for one isn’t necessarily the best idea for another. We all bring to the table different levels of knowledge and experience, different budgets, and different goals. Bugging out is the single most popular topic in all of prepperdom, that is for certain. I couldn’t even begin to guess how many words have been written on the subject. Yet, for all of its popularity and coverage in survival literature, people still struggle with the concept. I think at least part of that confusion stems from the common human desire to have someone just tell us what to do, rather than figuring out the solution ourselves. Here’s the thing. Bugging out means different things to different people. Generally speaking, I believe bugging out should always be a last resort, rather than a primary plan. However, I’m smart enough to know that even that rule will have exceptions. For me, bugging out means I’m going to have to abandon all of my goodies at home, grab my kit, and head for a safer location, such as the home of a close friend or family member, until the crisis has passed. For others, bugging out means leaving home and never planning to return. Some of those folks figure to head for the hills and live off the land for the rest of their days. Some people envision bugging out as involving heated gun battles as they fight their way toward their final destination. Because of this way of thinking, they load up their bug out bags with several firearms and many boxes of ammunition. Others plan for a more stealthy trip, doing everything they can to avoid any contact with other human beings. As a result, their planned bug out routes may take them miles away from a straight path, circling around towns and other potential problems. I, nor any other instructor, can tell you exactly how to craft your own bug out plan. Your situation is unique to you. However, I can give you some guidelines to consider. 1) Any confrontation carries a risk of injury to you and members of your group. It doesn’t matter how well armed and prepared you may be, all it takes is a lucky shot from the other side to bring down one of your people. It might be a better plan to try and avoid such situations as best you can. 2) Bugging out without a planned destination just makes you a refugee. Know where you’re going and how you are going to get there, including alternate routes. 3) Planning to live off the land for any length of time, for the vast majority of people, is folly at best. Avoid the Hollywood nonsense and apply a good amount of common sense when crafting your plans. Posted on August 7, 2015 Author Steve ThibeaultCategories Bugging Out, Preparedness3 Comments on What Does Bugging Out Mean to You? Two-way radios, the modern version of the walkie-talkies many of us had as kids, can be a great tool for emergency communication among family members. Provided, though, that you understand their limitations. Bear in mind, we’re not talking about amateur (ham) radio. That’s a whole different ballgame. These radios all use the same group of frequencies. On the plus side, this means you can easily program several radios to communicate together, even radios from different manufacturers. However, this also means that anyone else can listen in to your conversations if they hit upon the same frequency. Your safest bet when using these radios is to avoid talking about any confidential information on the air. Manufacturers like to make rather exaggerated claims regarding the range of these radios. You’ll see packages that say, “up to 25 miles” and other such nonsense. Yes, the radio might truly transmit that far…if there is absolutely nothing between the sender and receiver. The problem is that things like buildings and trees easily block the radios or at least inhibit transmission. Realistically, if you can get a mile or two of range from the average two-way radio, you’re doing pretty darn well. However, that also means that anyone who wishes to listen in to your conversation must also be in that range. Which, actually, might not be a good thing when you think about it. Many models of these radios take the rather common AA or AAA batteries. That makes life a little easier as you won’t have to hunt down some obscure size. However, by their very nature, batteries go dead after a while. If you plan on relying on radios like these, better plan ahead and add a solar battery charger to your preps. Unlike cell phones, for example, two way radios are sort of a closed system. The transmission is sent out directly to the receiver, rather than bounced off of a tower or satellite. This means that even if the entire electrical grid is down, the radios will still work (provided they weren’t impacted by the event that took down the grid, such as an EMP strike). There really isn’t a downside to this, other than the lack of towers and such helps to limit the effective range. Two-way radios are a fun way to stay in touch when you’re out and about with your family. When times are normal, they can help keep you from chewing up minutes on your cell phone. But, if you plan on using them after a major disaster, it is important to understand they are not always what they are cracked up to be. We are very fortunate to be living in what we might call a renaissance when it comes to disaster readiness. At no other time in history have we had such a wide array of products available to us. Of course, that also means it can be rather overwhelming when you’re trying to make a decision on which product or type of products will work best for you. Food storage is no exception. There many different options available to you as you plan for long-term food needs. Let’s talk a bit about each of the major categories of food storage. These are the things you likely buy every day at the grocery store. Canned vegetables and fruits, dry pasta, rice, and beans. If it comes in a can or a box, it probably falls into this category. The benefits to using these items is you are accustomed to eating them already, you know what you like and what you don’t. Preparing these foods is simple and easy, for the most part. The downside, though, is canned and boxed foods are often loaded with preservatives and other chemicals. They just aren’t the healthiest foods on the planet, y’know? On top of that, I can all but guarantee that once you’ve eaten fresh produce, like green beans and peas right off the farm, the ones that come in a can will probably turn your stomach. There are a few different ways to preserve food at home, such as home canning (pressure or water bath) and dehydration. Foods preserved in these ways tend to be healthier, as you are in control as to what ingredients are added. There is also a strong sense of accomplishment in knowing you are providing for your own needs. However, there is a fair amount of work involved, not to mention the investment in a pressure canner, dehydrator, and other supplies. Some of the more well known brand names in this category include Wise and Mountain House. These foods are specially packaged and preserved to last many years. Typically, all you need to do is add hot water and wait for the food to rehydrate. The nice thing about these products is there is little prep involved. If you can heat water, you can make dinner. Plus, these pouches and buckets are designed to last decades. There are a couple of potential downsides, though. First, these products tend to be more expensive than other options. Second, some folks have reported digestive upsets and such. What I suggest is, if you want to explore this option further, buy a few sample meals and try them out. See if you like the taste and make sure the food agrees with you. A common staple among preppers, MREs are either actual military surplus or are manufactured to the same guidelines and sold to the general public. Typically, one pouch will consist of a main dish, a side dish, a dessert item, crackers or bread, peanut butter or jelly, powdered beverage mix, a utensil, condiments, and a flameless heater. Basically, everything you’d need for a complete meal, all in one handy pouch. Because of this all-in-one nature, they can be nice to have on hand. Plus, the food merely needs to be heated, though it could be eaten cold in many cases. You don’t need to add water to rehydrate the food, just heat and eat. MREs tend to be very expensive, though, when compared to the other options on this list. They are also rather bulky, taking up far more space than an equivalent number of canned goods or dehydrated food pouches. 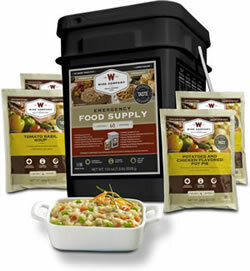 What I recommend is diversifying your food storage plans. Start with the canned and boxed goods you normally eat on a regular basis, then add in a box or three of freeze-dried foods and perhaps a case or two of MREs. Ideally, you should learn how to preserve your own food at home as well. It has become increasingly common to see and hear news reports of riots, looting, and other forms of civil unrest in our cities. The causes are varied but the fact is, if you live or work in an urban area, you are at risk of getting caught in the middle of a potentially violent situation. Obviously, the first thing you’ll want to do if you find yourself in a bad spot is to get out of the area as quickly as possible. If you are on foot, don’t try to go “upstream” through the moving crowd but instead move perpendicular to the forward motion, pushing to one side of the crowd. Once you are out of the thick of things, keep moving away from the area, cutting down side streets if possible. Link hands with those who are with you so no one gets left behind. If you are in a vehicle, you may find it a bit tougher to keep moving. Keep your windows rolled up and your doors locked. Do the best you can to keep going forward until you can turn down a side street. However, if you’re not familiar with the area, watch for signs that indicate the side street is a dead end so you don’t trap yourself. For those who live in urban areas, civil unrest can be a two-fold dilemma. Not only might you get caught up in the thick of things when you’re out and about, the riots and looting could make it unsafe to even leave your home. This is one of the many reasons why I encourage people to have enough food, water, and other necessities in their homes, sufficient to last at least a couple of weeks. That said, impending rioting and looting in your immediate area would be one of the rare occasions where I’d suggest you give serious thought to bugging out to a safer location until things settle down. There is a documented psychological effect at work in large groups. Often, it is called mob mentality. It is actually pretty scary when it happens to you. Without any real thought, you’ll find yourself mimicking the actions of those around you. Their emotion becomes your emotion. The issue at hand might have originally had absolutely no bearing on your life but suddenly it has become your passion. You’re angry, you’re upset, and you want to do some decidedly nasty things. Later, you’ll be at a loss if asked to explain what happened. It’ll all just seem to be a blur. If you find yourself getting caught up in the moment, try to remember to take a step back and breathe for a moment or two. Clear your head, calm yourself down, and give just a second or two of thought to the situation. Doing so might help keep you from doing something you’ll regret later.